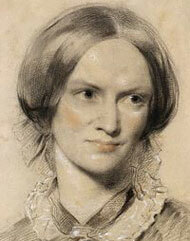 Charlotte Bronte (1816 – 1855) Novelist and Poet. After various efforts as schoolmistresses and governesses, the sisters took to literature and published a volume of poems under the names of Currer, Ellis, and Acton Bell Unfortunately these early publications were a commercial failure. However this did not deter Charlotte and she continued with her novels such as ‘The Professor’ and ‘Jane Eyre’. Jane Eyre proved to be tremendously popular with the public when it appeared in 1854. The novel has gained status as one of the classics of English literature for its originality and strength of writing. Charlotte was married to her father’s curate, the Rev. A. Nicholls, but after a short though happy married life she died in childbirth in 1855.